Invitation inserts are a nice compliment to any invitation. 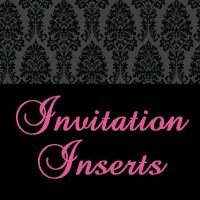 Do you have more wording that you need to include but not enough room on the invitation? Do you want to include your child's sizes and/or favorites? Inserts are a perfect addition for extra wording, details, maps, directions, etc. Our inserts come in various sizes and minimums. Inserts are printed multiple to a page and will need to be cut by the customer when they arrive. Inserts are available on photo paper only.